Tonight, it’s a late model heavy portion of the Gateway Dirt Nationals. On tap; 8 heats races, LCQ’s and two 20 lap feature events. 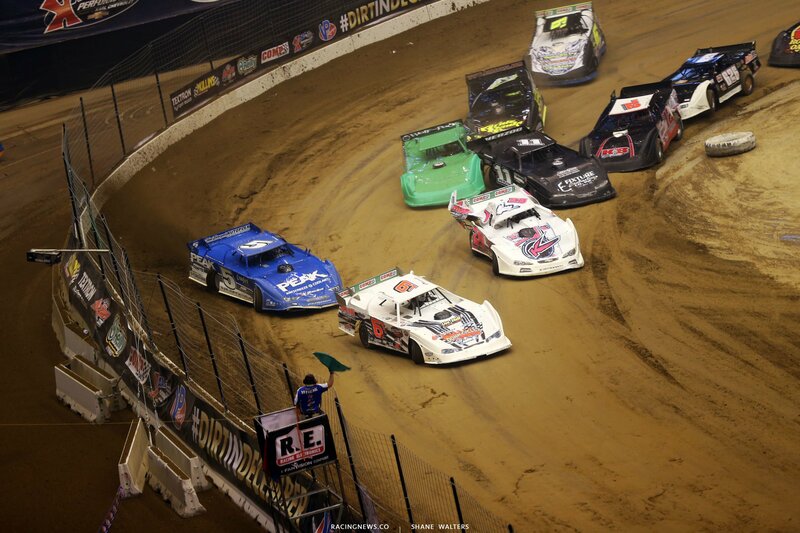 View full dirt late model results from Friday night at the Gateway Dirt Nationals below. The winner of each main event will pocket a check for $5,000. The lineups will be set based on heat race results. The track has received several changes overnight. Kevin Gundaker told me he took some dirt off the very top as well as the bottom and moved it to the middle. The center of the race track has a few more degree’s of banking compared to Thursday..
Jason Welshan and Austin Theiss lead the field to the first green flag of the night. Sheppard starts in 6th. Whelshan wins the race into turn 1. Several cars pile up. Green, one more pile up, this time Sheppard is involved. He continues to roll. Green, they pile up once more with 7 to go. The track is slick. Once they get rolling it will come in. Green, caution, spin in turn 1. Green, this time Sheppard dipped his left front onto the concrete in turn 3. Just as he did that, the rear came around. Caution. Green, Whelshan is driving away. 1 to go, Sheppard spins one more time. They stay green. Whelshan wins the first heat race of the night. Billy Moyer Sr and Rusty Schlenk ride out first. 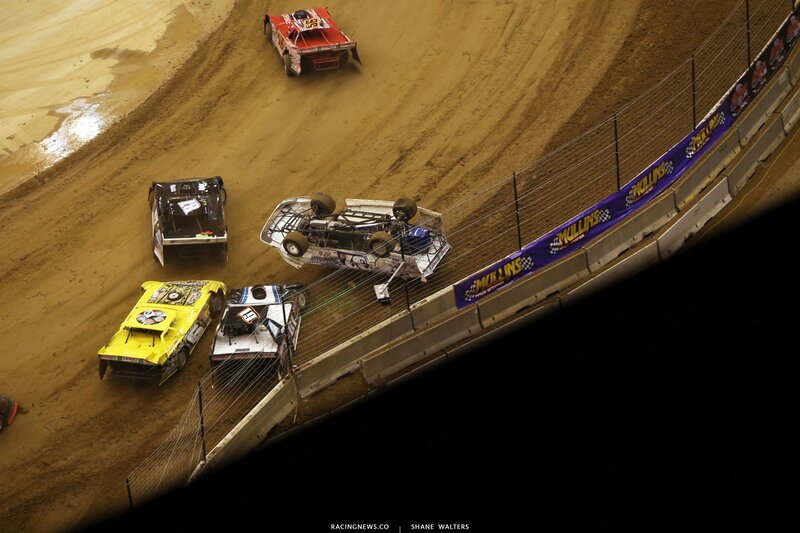 Green, Moyer gets the jump but Schlenk is all over him in turn 1. Spinner at the back, caution. Green, caution. Green, caution. Green, this time someone just pushed around right at the green, caution. Green, 6 to go, they’re finally rolling. 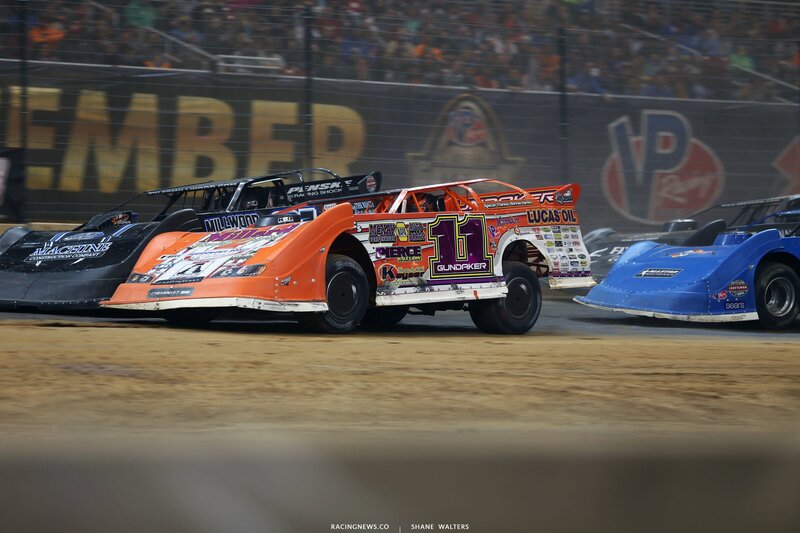 Schlenk is all over Moyer for the lead. The run even under braking. Schlenk just needs some drive off the corner to get him. Moyer holds on, he wins heat 2. Bob Gardner and Kip Highes set row 1. 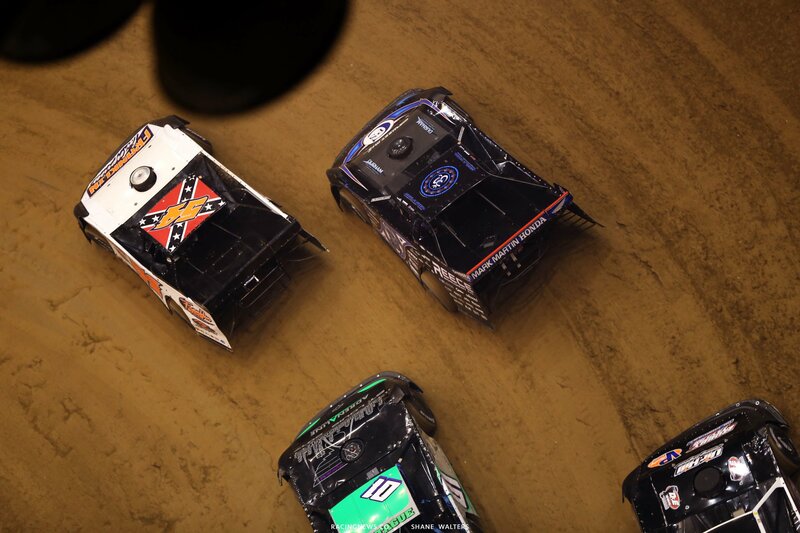 Green, Gardner takes the lead in turn 1, Moyer to 2nd. Green after a few cautions. 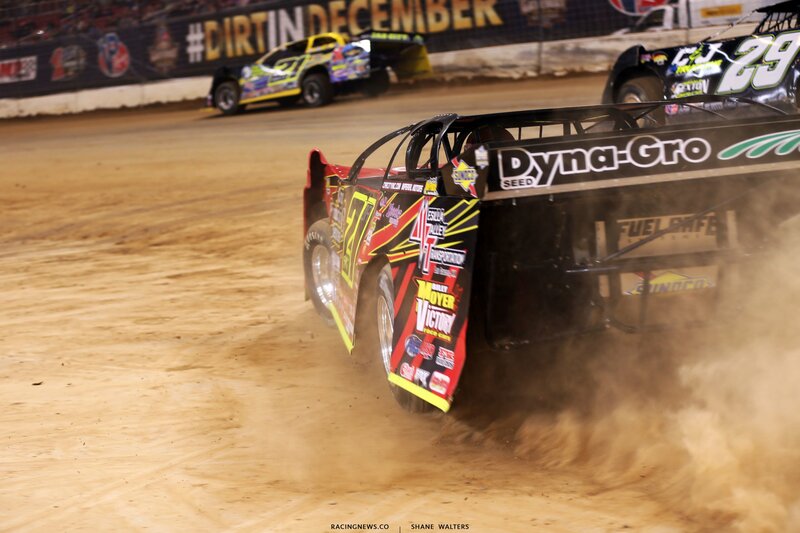 Moyer is fighting hard for the lead. He’s there but cant find a way by. He tried to door Gardner in the center of the corner and push him off the bottom, it didn’t work. Green, same move. This time it works. 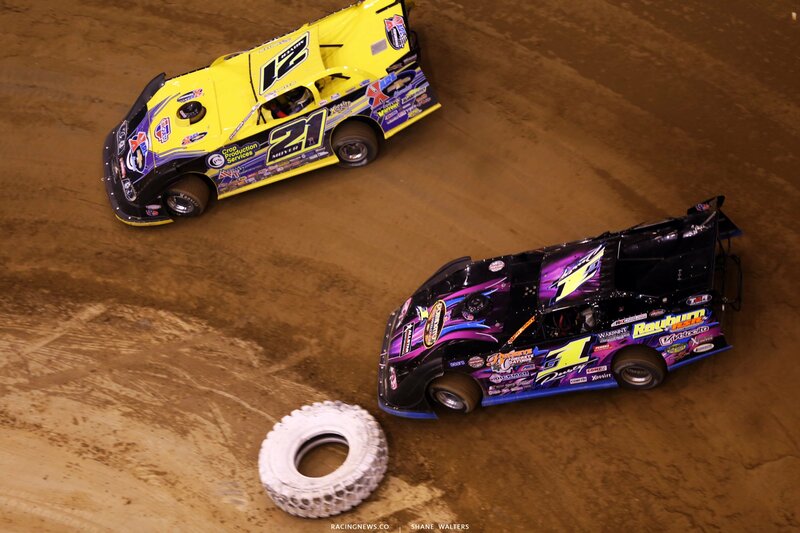 Moyer forces a hole to the lead off turn 4. Caution, spin behind them. Green, Hudson O’Neal makes the outside lane work on the restart. He’s up to 2nd and chasing down the leader, caution. Green, he’s all over Moyer with 1 to go. He’s nearly even with Moyer off turn 4. Side by side at the line, Moyer wins! 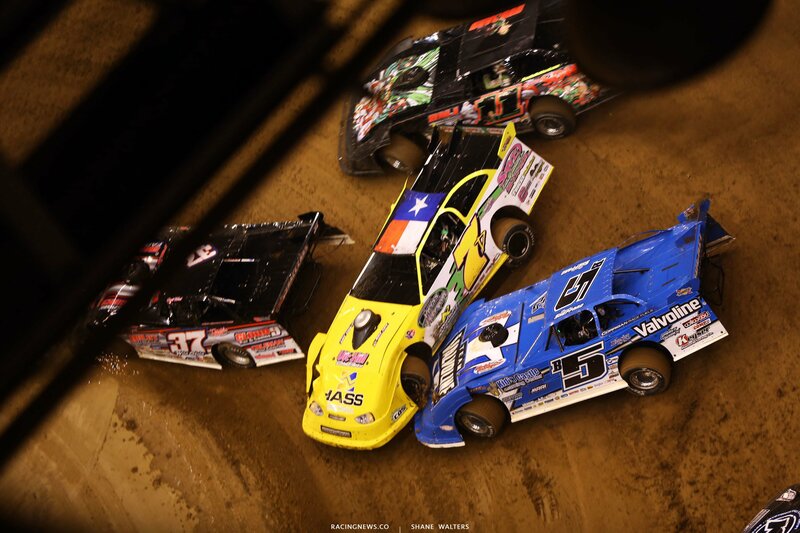 David Breazeale and Scott Bloomquist will be the first on the gas. 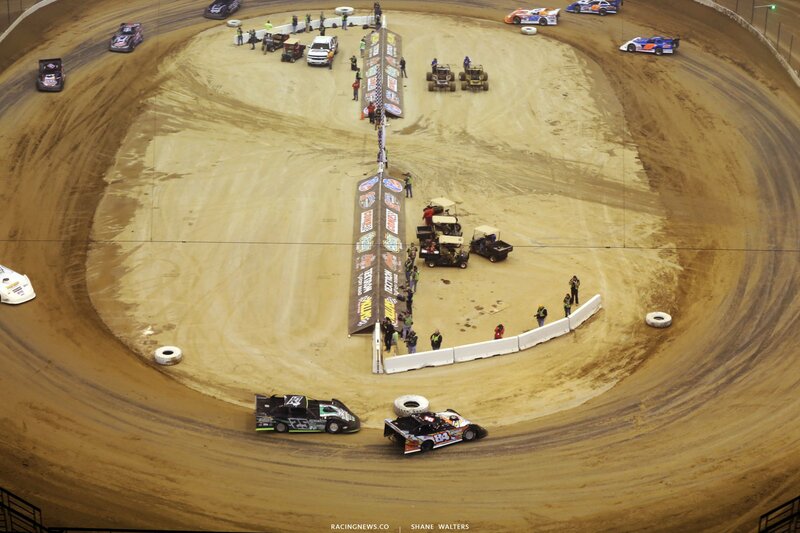 Green, Bloomquist spins off turn 2, he might have had a little help. Complete restart. 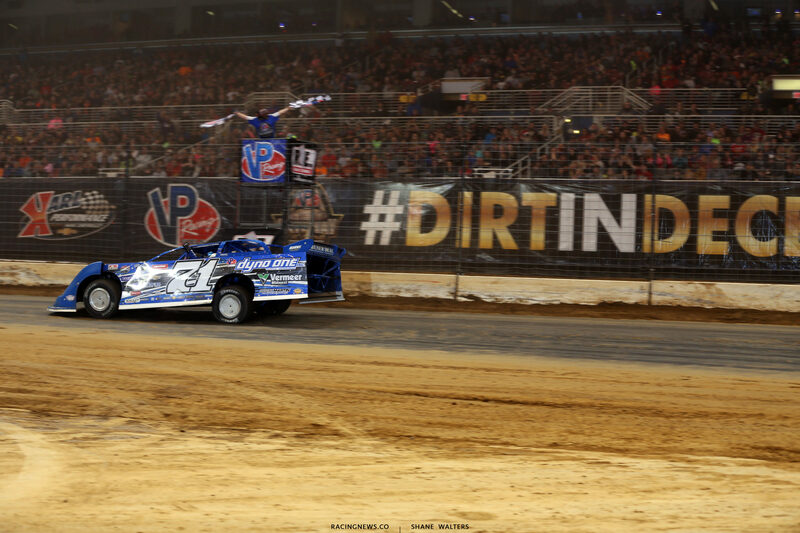 Green, Bloomquist runs high in turn 1, he loses a spot. Breazeale leads, caution. Green, 6 to go, Paul Roider looped it right when he stepped on the gas, he might have had help too. 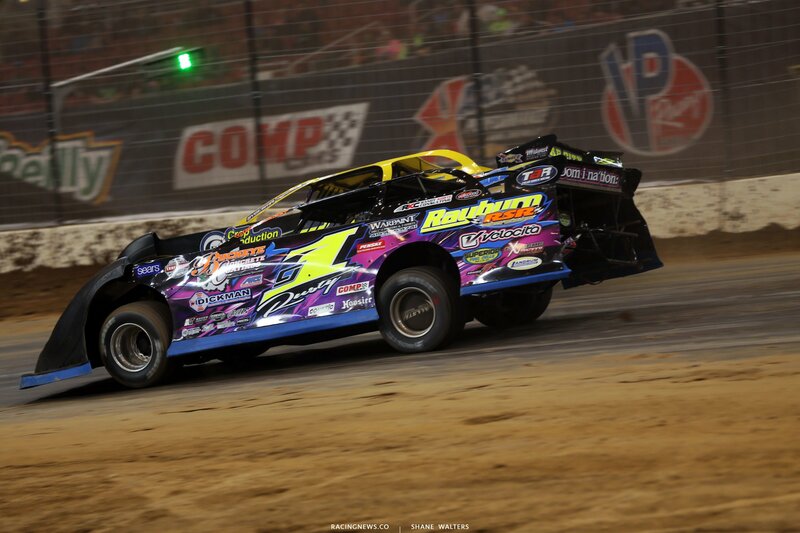 Green, Bloomquist has an issue. The car wont turn. 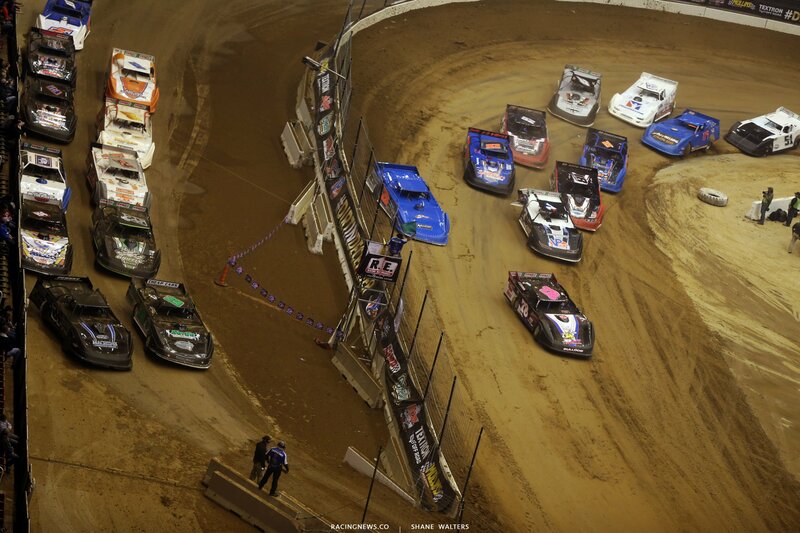 Bloomquist clips the front straight-away wall, more damage. He limps it across the line. Breazeale wins heat 4. Hunter Rasdon and the hometown driver, Gordy Gundaker set the front row in heat 5. Mike Spatola started outside row two, he dove to the inside in turn 1, under Gundaker. Lots of rooting out of the way, all the way through the field. It took nearly a full lap but they finally crashed. It will be a complete restart. Green, this time Derek Fetter held his ground on the inside of row 2. Gundaker, Fetter and Spatola were 3 wide at the line. Spatola looped it in front of the field. He clipped the right rear of Fetter as he spun to the infield. 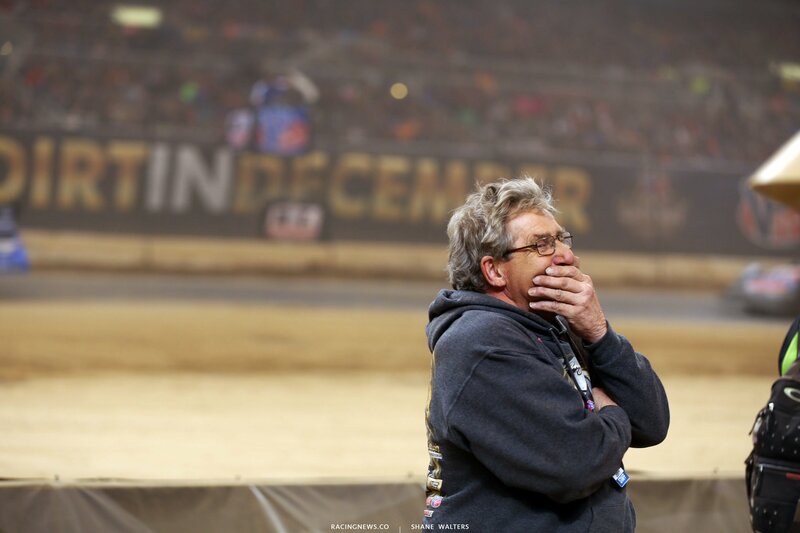 Fetter was sent at a 90 degree angle into the wall at the flagstand. Several cars came into the scene with nowhere to go. They scooped Fetter up and he barrel rolled into turn 1. Red flag is out. Green, spin in turn 1, still zero laps complete. Green, Gundaker is looking for a way around Rasdon. He’s all over him. Gundakers car rotated on a dime in turn 1. Almost point and shoot, like a shifter kart. He gets the drive off the corner and wins the race to the bottom in turn 3. New leader, Gundaker. Caution, spinner. Green, Gundaker is hooking the bottom lip in turn 1. I think that’s what’s making his car rotate so well. Gundaker drives off to win heat 5. Tim Dohm and Brent Larson line up first. Green, Larson grabs the lead on the restart. O’Neal tried working the high side, when the bottom opened, he took it. Several pile ups and cautions later, Larson wins. Another hometown driver, Chad Zobrist lines up on the inside of Dennis Erb Jr for heat 7. Last nights winner, Shannon Babb starts in 3rd. Green, Zobrist wins the race into turn 1. Dennis Erb Jr and Shannon Babb battle for the 3rd position. Most drivers are glued to the bottom. Rob Toland and Tyler Millwood set the front row in the final heat race of the night for the super late model class. Green, Toland wins the race into turn 1. Millwood is beating on his rear bumper in turn 3. However, Millwood gets the bad end of it. They spit him off turn 4, inside and outside. Millwood holds of Feger but he falls to 3rd. Trouble at the front! Toland has lost drive at the exit of turn 4. He was driving away. Now he’s heading to the pits. Myles Moos assumes the lead. Green, Millwood loops it in turn 1, caution. Green, Moos leads, Feger is all over him for 2nd. 1 to go, Feger loops it while trying to get under him in turn 1. Feger to the rear. Green, Moos drives off to win the final heat race of the night! Jason Welshan and Billy Moyer Sr will lead the field to green. Billy Moyer Jr is on the concrete in turn 1. He loses several positions. Billy Moyer Sr leads but pressure is coming. Rusty Schlenk is bouncing off the cushion and running down the leader. He’s there, Moyer moves to the top. Schlenk to the bottom. New leader, Rusty Schlenk as David Breazeale and Hudson O’Neal is closing on them both. 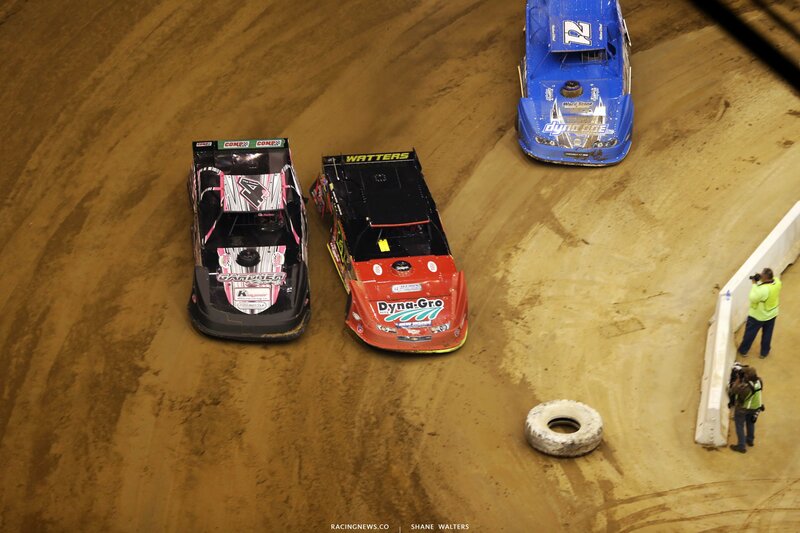 Breazeale follows Schlenk around Moyer Sr.
Schlenk gets sideways off turn 2. Tire spin, all the way off the corner. Breazeale gets a run on Schlenk into tun 3, contact, they both spin. Schlenk isn’t happy. He’s waving his hands in the air at Breazeale. Green, Hudson O’Neal assumes the lead. Big trouble down the back straight. Austin Hubbard is upside down. Red flag is out. He climbs from the car, with a limp but looks to be ok.
Hudson O’Neal and Jason Welshan line up at the front. Green, 3 to go, O’Neal has checked out. Hudson O’Neal wins the first of two main events. He’ll pocket $5,000. Gordy Gundaker and Tyler Carpenter lead the field to green. Green, Gundaker leads as they tangle in turn 1 for 3rd on back. Gundaker is glued to the bottom. Myles Moos is bouncing it off the top. He pulls even with Gundaker but the #11 holds him off. Similar to last year, there’s a bunch leading into turn 1. Gundaker is running right through it. They’re also running through traffic. Millwood is there, caution. Green, trouble, Myles Moos and Milleood are involved. Green, 6 to go, Gundaker leads Carpenter. He’s within reach but Gundaker holds him off. 1 to go, Kevin Gundaker is on the infield fighting back a smile. Gordy Gundaker wins main event #2 on Friday night of the Gateway Dirt Nationals!